This is the second of a two-part series in which we present Evan McMullin's platform in his own words, drawn from a series of interviews. The interview sources are linked in part one, which we published yesterday. Today we present Evan McMullin on the issues and focus on domestic policy. On judicial appointments: Louise Mensch of Heat Street asked whether McMullin would appoint Ted Cruz to the Supreme Court. 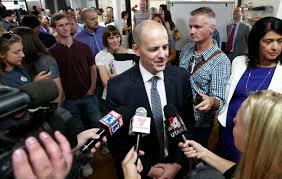 “I’m not making any commitments about who I would or would not appoint,” McMullin replied, “but I will tell you that I will appoint originalists. In the question that involves what I think about Roe v. Wade, I will appoint pro-life justices. Can Republicans hold the Senate?